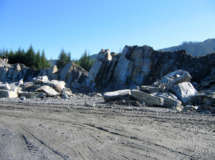 K2 STONE’S OCEAN PEARL QUARRY is located near Port Renfrew (100 km Northwest of Victoria BC on Vancouver Island). The quarry consists of a 150 hectare mineral lease, and five adjoining 25 hectare mineral claims, held with the British Columbia Ministry of Energy and Mines. K2 Stone has built in-house equipment and processes to maximize productivity and ensure quality targets are consistently achieved. The Port Renfrew Quarry produces our Ocean Pearl Stone which is a Metamorphic Slate with Quartz. 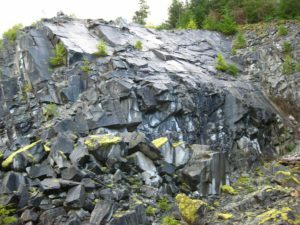 K2 STONE’S NEWCASTLE QUARRY is located at Duke Point in Nanaimo BC; it’s literally a stone’s throw away from our production facility. This unique tight grained sandstone has been used in architectural applications since the 1870’s. The old San Francisco Mint is one of the most famous landmarks that features Newcastle Sandstone. K2 Stone is one of the few companies currently distributing this particular sandstone geology. K2 STONE’S CROWN ISLE GRANITE QUARRY is located near Courtney BC, and is held through a partnership will a local quarrier and contractor. This quarry yields a classic salt and pepper granite that is very popular for all types of building applications. K2 Stone produces veneer, full bed, capping, hearths, mantels and other custom cut stone products from Crown Isle Granite. K2 STONE’S MONTANA QUARRIES are located in the Flathead Valley of Northwest Montana and provide for a unique mix of colours, shapes and sizes which complement our Ocean Pearl lines nicely.Our Montana Quarries produce our Chief Cliff Stone; an Argillite Quartzite which is native to the Prichard Formation.